18 months later and we are still enjoying our retirement and traveling in the RV!! A Day in California – Old Hippies Still Exist!! Hello World! Look out, here we come!!! So I guess if I am going to have a blog site then I need to start adding stuff to it. Been too content just to travel around since retirement that I have only posted on Face Book. It’s easier then bringing out the laptop plus I can type on my phone while traveling down the road. Not as easy with a laptop. So….I’ll be catching up on posts slowly but surely. They may not be in date order right now but I’ll post current locations and past so eventually I’ll get caught up. So we’re in California. I should say Crazy California. Have to pay for plastic bags at Walmart or bring your own. Who knew? We bought a bag for 10 cents. Couldn’t find a car wash anywhere. All we’re closed. Maybe because of a water shortage? Everything is very dry except the beautiful wineries. 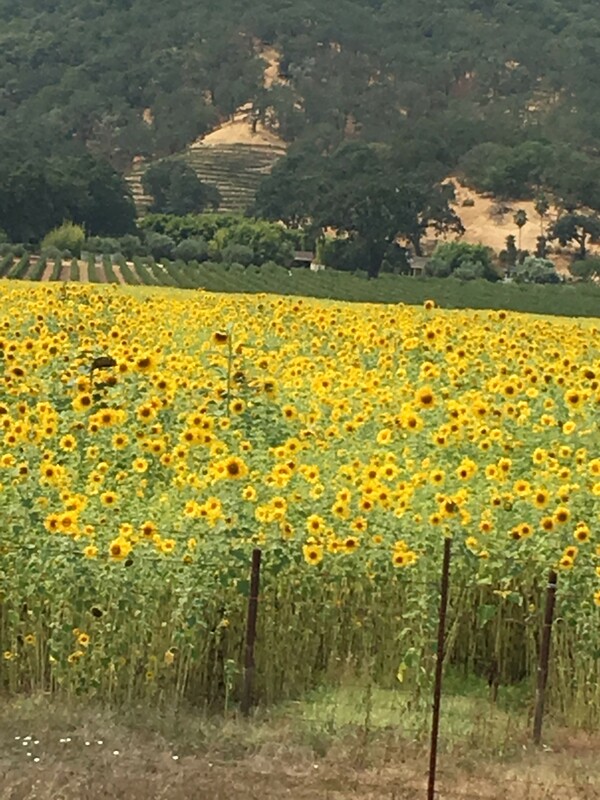 Passed a beautiful field of sunflowers though. Go to town to get my nails done and meet the sweetest old lady. Ok so she’s probably only 10 yrs older than me but still. She starts sharing the various places to go to around here and where to eat. Gave us the name of several good places to eat. She’s excited about our lifestyle and asks a bunch of questions and tells us a little about herself. Sweet little old lady. Ok. Old might not be the proper way to describe someone just 10 yrs older than me but I’m not ready to admit I’m old yet! Then she starts telling us about a place close by that has hot springs you can soak in and it’s very tranquil and beautiful and oh by the way – IT’S CLOTHING OPTIONAL!!! What??? Maybe she wasn’t as old as she appeared. Maybe she’s just spent too much time in the sun without her clothes! Gotta love those old Cali Hippies!! 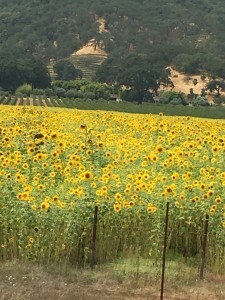 Enjoy the sunflowers! Previous Previous post: Hello World! Look out, here we come!! !